Coach Education – Why it is important for your players development. We encourage all our DYS coaches to expose themselves to coach’s education. Our players growth & development depends on our coach’s knowledge of the game, quality of instruction and ability to make soccer fun. US Youth Soccer has made significant investments to provide structured coaches education curriculum for you to take advantage of. DYS will reimburse all registration fees upon completion of each course. Please take the time get educated and learn this great game by taking the Grassroot license courses. See the excerpt below from the Mass Youth Soccer website. U.S. Soccer has announced eight (8) new grassroots level coaching education courses, these courses will be focused empowering coaches through experiential learning and a player-centered approach. The course options will relate directly to small-sided games and the respective age-groups outlined in the Player Development. The new Grassroots Licensing Courses will consist of (4) online options & (4) in person courses. 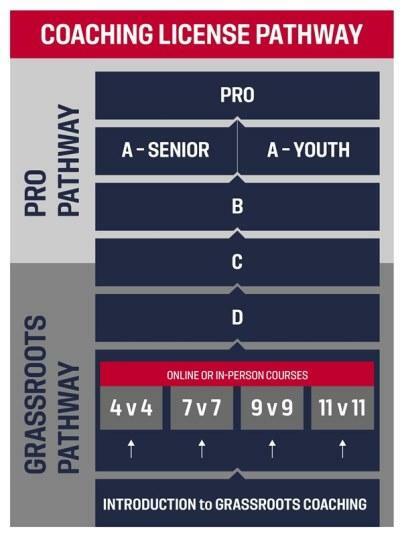 Prospective coaches will have the option to engage in any of these new courses - in any sequence - after completing a free introductory module provided by U.S. Soccer. This new, a-la-carte approach is meant to empower Town Coaches to access education. We recommend you attend these licenses in person, so you can listen, watch and interact but if not available locally or time is an issue then please start with the 4v4 course online. Whether you are the unfamiliar parent volunteer, the transitioning player or an experienced coach, you will walk away from these courses with more knowledge and a better understanding of how to effectively develop and communicate with your players. The grassroots license pathway is the worth the investment of your time and will pay dividends in your coaching years ahead. These courses provide a supportive approach to teaching and coaching players at 4v4, 7v7, 9v9 and 11v11. Grow through the years with your players.